in the outer right corner of each. Sav, "The gambler couldn t resist cheating, and he switched his hand for a Spade Flush." 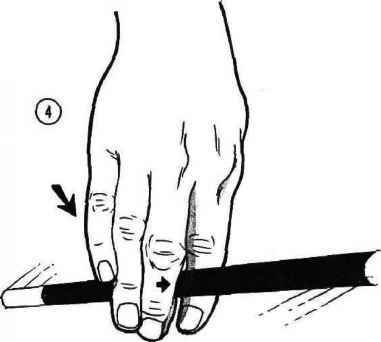 Pick up the spectator's hand and flip it face up sideways, so the pencil-dotted end remains outward. Hold the packet with both hands and spread the face card to the right with your left thumb. Beneath the packet, your left fingers spread the lower three cards to the right so their edges protrude slightly from the front (fig.3). Thi>sub;ie handling gives edges to the glued-together cards. After you display the hand for a moment, square the cards and turn it face down sideways. Place it back on the table. Pick up your hand and spread it as just described to show a full house, two Tens and three Fives. Square it. turn it face down sideways, and table it. and a Ten using the same handling as before. Turn over (he spectator's cards from left to right. The first card will be the Four of Spades (dramatically it is better to get this indifferent card out of the way before turning over the Aces). Turn over the other carcN to reveal the Aces. Turn over the cards in your hand to reveal the Nine through King of Spades and say. "He had the four Aces, but I had a push and beat him." Gather all the cards together and drop them on top of the deck. Pick up the deck and. during a convenient moment, "right" the reversed lower half. The two gimmicked cards, which were discarded during the final sequence, are not returned to the deck. Rather, they are simply lowered into the lap. or pocketed, when attention is elsewhere. The deck is clean and you can proceed as desired.